MENSenSTRAAT (STREETS for ALL) is a network in the Netherlands, aiming to make every street safe and enjoyable for all sorts of people in their various walks of life. o Passers-by to keep an eye on the street, enhancing social safety. 1. Give priority, wherever possible, to the interests of human powered street users. That means restricting motorized traffic in its speed, as well as in numbers and parking-space. In general, more than 90% of the streets can, with adjustments, be incorporated into large, uninterrupted ‘Habitat-areas’. 2. Give these ‘Habitat-areas’ an overall speed limit of max. 30 km/h (or less). 3. Turn large portions of public space into ‘woonerf’ zones, and streets for pedestrians and cyclists. 4. Provide safe and inviting sidewalks on the remaining 30 km/h streets (or turn them into woonerf). 5. A few roads may, if necessary, be arranged to accommodate streams of motorized traffic. Conditions are: a speed limit of max. 50 km/h (or less), ample space for pedestrians and separate paths for cyclists, as well as good facilities to enable safe and easy crossing for all. Public space should be redesigned, wherever necessary, to bring the behaviour of traffic in accordance to the intended circumstances. 1. Design for all: Do not focus the design on middle-aged healthy workers, but take different abilities into account. 2. Design in reverse order: Define, to begin with, the needs of residents, pedestrians and cyclists. Then make space for public transport. And at last, fit in car traffic and parking, insofar that is feasible and acceptable. 3. Create an enjoyable variety of streetscapes, emphasizing attentiveness and caution. The ‘woonerf’ was introduced in this country in the 1970’s, as a ‘street for children where cars are allowed’. The traffic-rules were adjusted accordingly. Nowadays more than 1 million people in the Netherlands live on woonerf streets. Essential is that pedestrians and playing children may use the full width of the street. A special lay-out is required, inducing car-drivers to drive very slowly (official maximum 15 km/h) and behave like a guest. Parking may be allowed, but on specific places only. You can find more information in English on the site of our partner woonERFgoed. 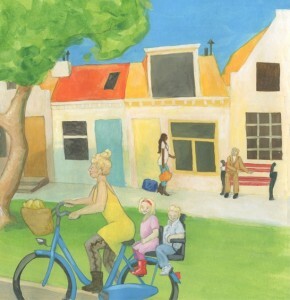 On our website the header reflects a children perspective on a people-friendly street. As transformation takes decades, inspiration is important to imagine a better future. MENSenSTRAAT is a network of people valuing the importance of public space for the quality of life. Therefore we cooperate with local initiatives, the Cyclists Union and organisations of senior citizens. To exchange knowledge and experience we joined the IFP, the International Federation of Pedestrians. on the Cities for all (design for all) perspective at www.880cities.org. on the Children perspective at www.childinthecity.org. on the Walking perspective at www.walk21.com. Let’s work together to make streets safe and enjoyable for all.